Associate involvement key to improved safety and performance at this busy Sam's Club cross-dock. Before national retailer Sam’s Club brought KANE in to operate its busy cross-dock facility in Brownstone, Mich., costs were high and the safety performance needed to improve. Sam’s Club hoped KANE could reverse those trends, and KANE did, taking the Michigan facility from an underperforming ninth place to third place on the Sam’s Club operational index. How did KANE do it? 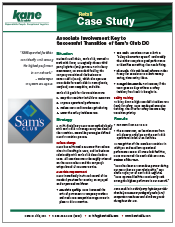 In this one-page case study, learn how KANE helped Sam's Club drive down safety incidents and improve operational performance, all while keeping the transition invisible to customers. Fill out the form on this page to access the case study.